Preheat the oven to 400°F. 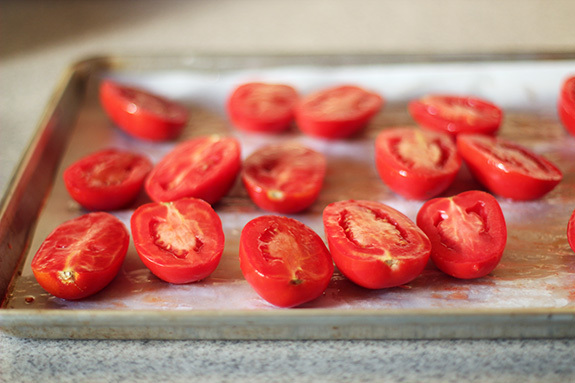 Place the tomatoes cut side up on a baking sheet. Drizzle with oil and sprinkle with salt. Rub oil over both sides of the tomatoes. Place the squash on another baking sheet, drizzle with oil and sprinkle with salt. Rub oil over all sides of the squash. Roast the tomatoes and squash for 30 minutes, flipping the squash halfway through. The tomatoes should be shriveling but not bursting and the squash should look nicely browned. Chop the onion, mince the garlic and grate the ginger. When the tomatoes and squash are almost done, heat about 2 tablespoons of oil in a large pot over medium-high heat. Add the onions, garlic and ginger and cook, stirring frequently, until the onions are soft and translucent. Add the tomatoes, squash, coconut milk and stock and bring to a boil over high heat. 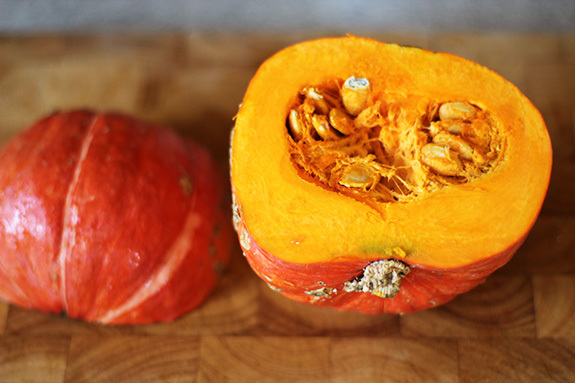 Reduce heat and simmer for 15 minutes, or until squash is very soft. Taste and add salt if needed. 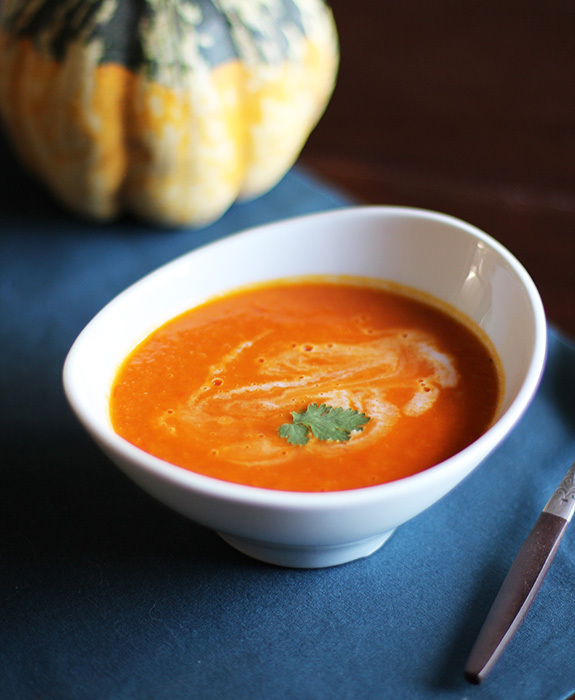 Let soup cool slightly and puree until very smooth with a stick blender or in batches with a countertop blender. Taste and adjust seasoning, adding a squeeze of lemon if soup needs a little brightness. Serve immediately or let cool and freeze for up to 3 months. • For a pretty garnish, reserve a couple tablespoons of coconut milk to drizzle over the soup before serving. 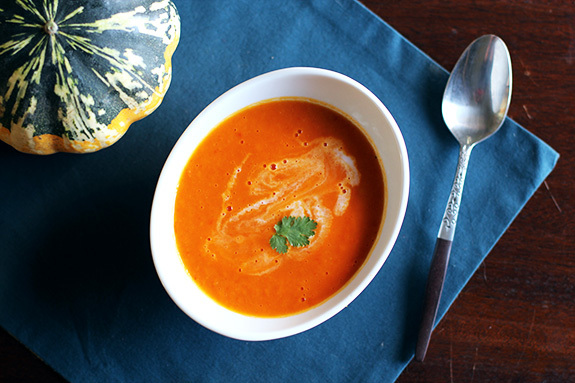 • I've made this soup with butternut squash and ambercup squash (the cut squash pictured above), but any type of firm, orange-fleshed winter squash would be tasty. Your blog is so nice, even my email address looks beautiful as I type it into the comments section. Also, your soup is so beautiful that I would make t immediately, regardless of how many soups I’ve made this week. It is so up my street that I feel like we are neighbours. Me and the soup that is. Not you and me. That would be weird. Thanks, Denise! I hope you enjoy it. wow.. the ingredients and the recipe looks pretty good, one cannot go wrong with this. Its excellent! I love the combination of flavors in this soup. and I would eat anything that has tomatoes in it! oh wow! What a beautiful photo. Excited to try this soup. I love using coconut milk in place of cream in purees. It’m always surprised how versatile the flavor is. Anjali! I just made this soup and it was amazing. I substituted coconut oil for vegetable oil to make it more coconut-y. I also recently made your bean masala dish with the rice and everything, and it was also amazing. I’ve given up refined sugar for the month of Feb, and it has made me look a lot closer at what I’m eating. As a result, I’ve found myself steering towards healthier veggie-packed meals, and your recipes have been really helpful. Plus, they are great for a grad student budget. Anyway, you’re an inspiration! Thanks, Pam! Healthy, veggie-packed and budget-friendly is always what I’m aiming for, so this is so great to hear. Good luck with your sugar-free February! This soup looks so yummy! We did not have a good tomato crop this year, but it looks like we will have plenty of winter squash. Do you think it would work with softened sun-dried tomatoes? Nicole, I think they would add great flavor. You’d probably have to experiment with using more squash and stock, since the tomatoes add body and liquid to the soup. Let me know how it goes! This soup is wonderful. I just finished making it and it is so healthy and light on calories. The ginger is a great hit, too. We thought it was delicious with crab meat in it as well.